Given the current situation in Venezuela, Republican Senator Marcos Rubio believes that the US should work with the Lima Group to coordinate their national sanctions with the growing initiatives, with the purpose of concentrating on the criminal elements of the Maduro regime, their access to the banking and international financing. In addition, on those subjects, ghost companies and other entities that make use to evade foreign financial pressure. According to Rubio, the objective is to spread the pain of corrupt, abusive and fraudulent officials in Venezuela that harm democracy and human rights, as well as those actors that keep them in power.The United States is the coordinator of the efforts to alleviate the humanitarian crisis, since as millions of Venezuelans flee their country to escape hunger, deprivation and violence, neighboring states are forced to bear excessive burdens and they need foreign assistance. According to considerations of the "brilliant and enlightened" US senator Marco Rubio, this is the moment to accelerate the exit of Venezuelan President Nicolás Maduro because his regime has become a danger for Latin America and the security of the United States. 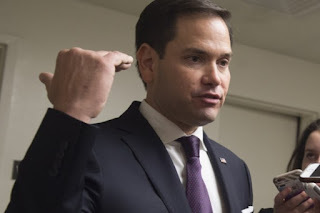 Rubio, who is a Republican senator from Florida, affirmed that Venezuela is at a turning point for its people and the Western Hemisphere and this could constitute a threat to US interests. According to Rubio, the regime of the Venezuelan dictator, Nicolás Maduro, is a state sponsor of drug trafficking. He recalled that the US government sanctioned the vice president of Venezuela, Tareck El Aissami, and called him a drug trafficking leader, and that the nieces and nephews of the first lady, Cilia Flores, were sentenced last year to 18 years in prison in the US on charges of drug traffickingIf we add to all this, the Chavez regime provides refuge to organizations that the United States has determined to be foreign terrorist organizations, such as the Revolutionary Armed Forces of Colombia (FARC) and the National Liberation Army (ELN). The congressman emphasized the attack on the democratic order that the Maduro regime has provoked and the alliances it has formed with the enemies of the United States, including the Cuban dictatorship, Russia, as well as Iran and Hezbollah. For the senator, the collateral effects of the authoritarian actions of the Maduro regime hurt the efforts of the United States and its regional partners to promote democracy, human rights and stability in the Western Hemisphere. Referring to internal issues, he asserted that corrupt management, economic mismanagement and the violent suppression of popular dissent by the Venezuelan dictatorship have provoked a strong humanitarian crisis of historic proportions. Likewise, the destabilizing flux of millions of Venezuelan migrants has saturated the resources of adjacent countries such as Colombia and Brazil.Before the nebulous and sad scenario that Rubio puts before the eyes of others, he considers that although the US and its partners have repeatedly condemned the Maduro regime and demanded the end of the crisis, now they must accompany their words with decisive actions.Rubio urges that the democratic nations of the region work together and hasten Maduro's exit from power. After putting on alert of the crisis in Venezuela to all and that such a crisis has become a complex regional challenge, the legislator incited the US to convince the nations of the Lima Group and other countries that have the same line of thought to hold meetings with the foreign ministers and finance ministers in May to chart a regional path based on three elements.